If you’re interested in getting grossed out- read the Wikipedia article on Lyme Disease, making sure to study all the pictures along the way. But if you’re an avid disc golfer, you already know all about it. Whether you’ve had Lyme, ticks, or friends who have had both: it’s impossible to ignore as you trek through long grass and climb under tree limbs on a daily basis. Personally, I’ve only ended up with two uninvited house guests (ticks) in three years. 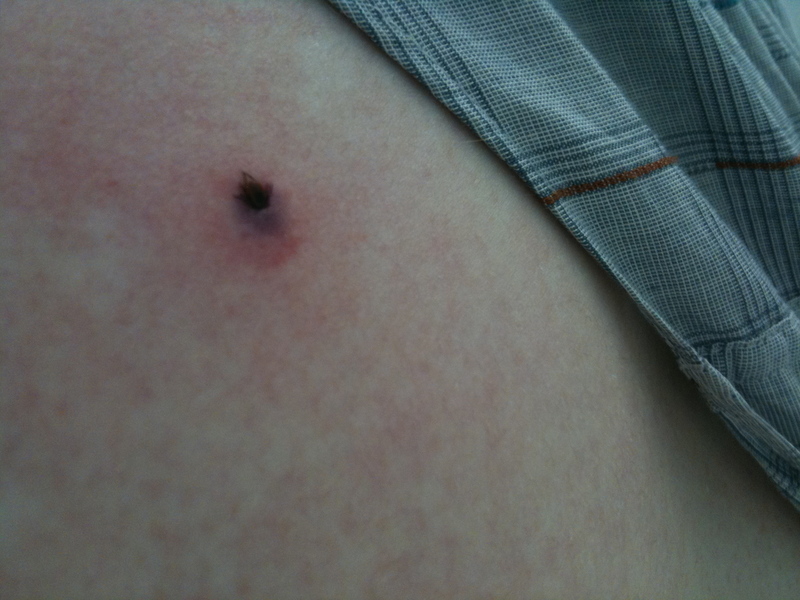 Both of these were this spring, and luckily neither were the species of tick that carries Lyme Disease. The removal of the one tick was improvised, as a classmate used a heated up screw-driver to melt it, as if I were being branded. In any case, the list of specific and disgusting stories I could write would easily span three pages with just the people I play with every week. No matter what your background or opinion or approach to the problem- once you get a tick, and once you get Lyme Disease, you’re forced to react medically. After all is said and done however, we’re all left with a choice: Do we go back out there and play again? Probably the easiest way to fight it as a disc golfer is to develop a routine. Simply shave all the hair off your body, oil-up before each round, and play naked- making it impossible for anything to stick to you… or not. Seriously though, using bug spray liberally on your hat, shoes and socks- and keeping clothes separate from your other clothes until their washed goes a long way. Also taking a shower after each round keeps your wife and roommates happier as well as keeps the ticks out of your bed. They can hang around for days in your house just as they would hang around in the woods. Personally I like to look at it much like brushing my teeth. Once I developed a routine and it became a habit, I easily avoided the pitfalls of bad teeth. Just try to remember though, that ticks can be a serious game changer for you and all of your disc golfing friends. This entry was posted in Stories and Miscellaneous and tagged article, articles, course, dg, dgsquared, disc, discgolf, disease, golf, lyme, magazine, online, publication, review, squared, tick, ticks. Bookmark the permalink.